How much are wedding flowers? You have probably heard the rumours or read the glossy wedding magazines and got scared at the prices of wedding flowers, I know I have. At a recent friend's wedding the flowers were so costly that the floral displays were transported from the church to the reception by hand, a great way to get the most from your flowers. Ideas on how to save money on your wedding flowers are here. 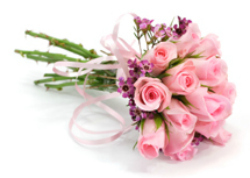 The average wedding spends 8% of the wedding budget on flowers. If you have a small wedding budget then the amount you have to spend will be less. That doesn't mean you will end up with a couple of daisies from the back garden but that you will need to find a florist that can work within your budget. The better the florist the better they will be at this. You will need to have an idea as to what color and the type of arrangements that you will need. Get pictures from magazines and online that you like to take with you. A good way to see a lot of local florists is to visit your local wedding fair, you can then check out their work and ask them questions. Get quotes from as many florists as possible, make sure you are comparing apples with apples and that the price includes transport, ribbons, wire, service and vat. Listen to their recommendations as they are the experts and will have lots of great ideas to help you maximise the budget. Another alternative is to have silk flowers, they have come a long way since the seventies! For my wedding we had a mixture of silk and real flowers, this could work for you too.